NPL’s broad engagement with the local school system is unique in the United States. For example, NPL’s early reading outreach program Bringing Books to Life (BBTL) aims to elevate student third grade reading skills, one of the most important predictors of student success. NPL educators deliver pre-K reading workshops across Nashville for teachers, parents, caregivers, and families, on weekends and evenings, in English and Spanish. Participants get supplies and tips for easy activities to incorporate reading, singing, writing, talking, and playing into their classrooms and homes. After participating in BBTL programs, practically all—98 percent—of teachers introduce what they learned to their curricula, and almost as many—96 percent—use more literature-based lesson themes in the classroom. Over 90 percent say that children use books in classroom centers and that parents engage more often in literacy-related activities with their children. Though BBTL is only one of NPL’s educational offerings, its cumulative impact alone is impressive: since 2003, BBTL has served 139,327 children, teachers, and parents (particularly impressive as a percentage of NPL’s total service population of 678,889, comprising Nashville and the surrounding Davidson County). 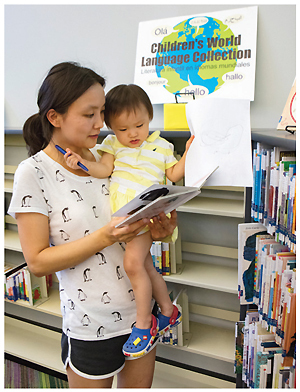 Last year, BBTL hosted 1,227 family workshops, teacher trainings, and story times at 152 locations. Perhaps NPL’s most renowned educational effort is a partnership with Metro Nashville Public Schools called Limitless Libraries. Since 2009, NPL and the schools have worked to increase student access to books and technology and enable students to borrow hundreds of thousands of books, movies, and other items from NPL without leaving school. Students and teachers order NPL materials via their school libraries, and they are delivered to every Metro school every weekday. Borrowing has increased at school libraries, and collection quality has improved since the program began. So has investment: NPL has infused nearly $7 million into school collections. NPL also brings technology to school libraries, including iPads, 3-Doodlers, 3-D printers, and hundreds of checkout laptops for homework. Via the Limitless partnership, NPL has also injected $4 million into school library environments, transforming them into colorful, interactive learning hubs with multipurpose classrooms, reading nooks, and Maker spaces. Eight have been renovated or built new so far, and NPL will offer more collection resources and school library renovations going forward, thanks to almost $2 million donated to Limitless Libraries from private and corporate contributors through the NPL Foundation. In 2015, the program expanded to students in grades three and up, adding another 15,000 to the Limitless Libraries roster. Such deep connection is enabled by how Nashville works. “One reason it is such a good collaboration is that we are both funded through Metro. We each have our own budget, but when we overlap it is very easy to work out the funding,” says Oliver. Another reason for easy collaboration: personnel who see both sides. 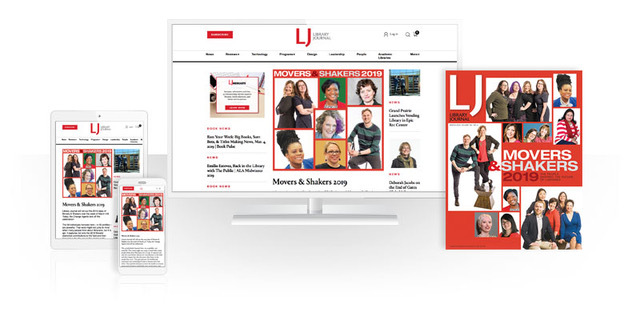 Stephanie Ham, a 2014 LJ Mover & Shaker who now heads the school libraries, used to be NPL’s coordinator for Limitless Libraries. In addition, NPL will soon help increase access to its materials in the city’s growing number of charter schools, most of which do not have libraries or librarians. Many libraries have bookmobiles and techmobiles, but NPL is distinctive in having a puppetmobile. In 1938, puppeteer and later NPL staffer Tom Tichenor introduced puppetry to NPL, then went on to earn international fame on Broadway and television. He returned to his Nashville hometown to retire and gave NPL 250 of his handmade marionettes. They now travel the city in the NPL Puppet Truck. The NPL staffers include professional puppeteers who perform stories that students and children study in a BBTL workshop. Since 2003, the Puppet Truck has given performances for 300,347 children and adults. Puppetry is a core part of storytelling at NPL, at home and on the road. Wishing Chair Productions, the library’s resident puppet troupe, performs 20 shows a week at NPL’s Children’s Theater in the Main Library—more than 400 since 2015. The ambitious “String City” puppet show relates the story of Music City’s roots. In a production that’s been described as “a love letter to Nashville,” some 80 puppets make appearances, including depictions of Minnie Pearl, Johnny Cash, Reba McEntire, Dolly Parton, and Garth Brooks. In 2016, NPL invited an international network of puppetry artists for a free three-day festival at the Main Library. This was the fourth time NPL had brought tens of thousands of curious patrons to discover storytelling through puppetry funded entirely by the library’s foundation. Yet the Civil Rights Room is much more than a monument to a past moment in history: it’s deeply embedded in the ongoing struggle. 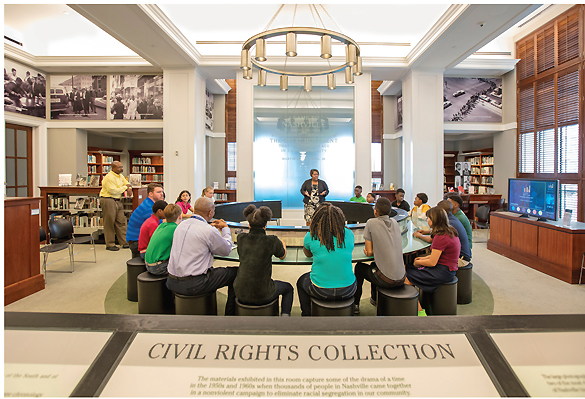 In 2015, the Metro Nashville Police Department asked Andrea Blackman, manager of the ­Library’s Special Collections, which includes the Civil Rights Room and Collection, to help educate police academy recruits about the civil rights movement. Blackman and her team created “Civil Rights & a Civil Society,” a program in which future officers spend a day in the Civil Rights Room, learning about milestones in Nashville’s civil rights history and reflecting on how it has impacted current local law, order, and policing. They examine pertinent photographs and documents, describe their own perceptions about what they see, and compare their initial assumptions against historic facts. NPL’s take on the Maker space movement is Studio NPL. There, local professionals from industry, science, technology, engineering, art, and math serve as mentors to middle and high school students in eight studios, including a flagship at the Main Library and a mobile unit. With a grant from the federal Institute of Museum and Library Services, plus private and corporate support through the NPL Foundation, the library has engaged local teens to help design their own projects. Teen patrons learn how to record voice-overs for their films, create podcasts and public service announcements, and design and fabricate on 3-D printers. They study coding and creative writing. More than 36,000 teens have used Studio NPL and participated in 3,550 workshops. In addition to teaching teens, Studio NPL has become a learning ground for teachers, librarians, and youth workers who want to get ideas and technical literacy. The Nashville After Zone Alliance (NAZA) is a co­ordinated network of after-school programs at schools and community sites, and students from Metro Nashville schools in grades five through eight spend their weekdays from 4–6 p.m. at these locales. They receive homework help and develop enrichment skills, everything from dance and fashion design to bicycle repair and science lab activities. They are encouraged to experience positive peer interaction, build confidence, discover new interests, and read. Since 2010, NAZA has served more than 7,800 students. In 2014, it moved from the mayor’s office to NPL, which has integrated NAZA into its structure, expanding reading and literacy opportunities throughout NAZA. NPL makes NAZA’s public and private dollars do more by coordinating marketing, scheduling, transportation, and resource sharing for the entire network. NPL’s education focus doesn’t stop at high school graduation. Its adult education efforts cover a wide spectrum of literacy topics, designed to meet real, local needs. Partnerships with like-minded organizations are a key component. Nashville’s lifelong learners visit NPL to learn how to read, read more, or read better. They come to use public computers and technology, become stronger English speakers, study U.S. civics, increase their health literacy, and gain financial skills. More than 800 adult literacy classes and workshops were offered at NPL in 2016, and nearly 7,000 adults benefitted; in three years NPL has helped to reduce a citywide waiting list for classroom space. As with its teen Maker efforts, NPL is now a central hub for adult education practitioners as well as students. In 2016, 746 volunteer and paid adult educators attended NPL-sponsored professional development events. NPL hosts a yearly Adult Education Symposium and pre­sents an annual Adult Educator of the Year Award. Beyond traditional, tech, and financial literacy, NPL offers free health activities and resources for better health literacy. The program operates in six branches in neighborhoods where access to health and wellness materials and services is more limited, in addition to yoga, cooking, nutrition, and fitness classes at all locations. In 2016, NPL delivered 400 health and wellness programs to more than 8,000 people with support from a three-year grant from the BlueCross BlueShield of Tennessee Health ­Foundation. More than one in ten Tennesseans have no access to the Internet and 44 percent of Metro school students have no access to a computer or online connection at home. Roughly 55,000 Nashville households need ­assistance to enter the digital age. NPL’s public computers are used nearly 800,000 times a year, in ­addition to its free Wi-Fi. Besides providing such basic digital infra­structure, NPL launched a customized version of the national ­digitallearn.org platform, making NPL only the second library to pursue this partnership with the Public Library Association. NPL’s digital literacy team takes a mobile computer classroom across Davidson County, focusing on outreach to senior citizens, families in at-risk communities, and young adults ages 16–24. 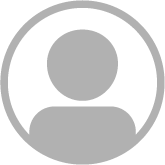 The NPL team works with partner organizations to help users navigate online tools, obtain employment, and access NPL’s e-collection. NPL is also the primary training partner in a citywide initiative called Anytime Access for All, as well as participating in the national ConnectHome enterprise. Supported in turn by corporate donors through the foundation, NPL sustains one of 16 Google Fiber/NTEN (Nonprofit Technology Network) ­Fellows. LJ editor panelists select up to six finalists from among the total pool of entries and invite external judges to participate, including one representative from Gale Cengage Learning, the award’s sponsor; the judges each choose their first-, second-, and third-place candidates from that field and convey their vote to the coordinating LJ editor. Each vote is assigned a corresponding point value, and each vote is given equal weight. The cumulative totals determine each year’s award winner and honorable mentions; any ties are broken by LJ editors. With NPL’s own streaming local music library, patrons can listen to talented friends and neighbors performing music that’s created locally. NPL BoomBox, filled with artists and albums from many genres, is another NPL strategy for inspiring community conversations. As bands and fans share music on social media, this initiative has also helped NPL reach younger folks. So far Ben Swank, former drummer for Soledad Brothers and cofounder of Third Man Records, and Ann Powers, music critic and correspondent for National Public Radio, have signed on as guest curators, who review submissions from local artists and select the next additions to BoomBox. This connects patrons not only to up-and-coming musicians but also to big industry players based in town. The developer with whom NPL partnered used open source code to build BoomBox, so the project is replicable. Music is far from the only way that NPL elevates Nashville residents’ thoughts. After the Orlando Pulse shooting, NPL turned its booth at the local Pride Fest into a conduit for the voices of local LGBTQIA people, inviting festival-goers to write messages for victims and their loved ones and to all LGBTQIA people of the past, present, and future throughout the world. People posed for photos holding their messages. For eight hours NPL ran a “Twitter takeover” of its account, tweeting the images. More than 100 attendees participated, catching the attention of Mayor Megan Barry, Congressman Jim Cooper, and others, to reach a total audience of more than 100,000 people. Ryan Darrow, a 2017 LJ Mover & Shaker, designed the project. NPL also hosted a community survey, asking people about their concepts of identity and safe spaces. In 2015, the National Endowment for the Humanities and the American Library Association chose NPL as one of 200 sites to host the national program “­Latino Americans: 500 Years of History.” The library’s Special Collections team worked with people in Middle Tennessee to chronicle the impact Latino Americans have made in Nashville and around the country. From fall 2015 through summer 2016, NPL facilitated 36 programs for 2,079 participants of all ages and cultural backgrounds, including recording oral histories by Latinx Americans in Nashville. Community voices also drive NPL strategic planning. The NPL 18-member Immigrant Advisory Committee (IAC) represents 12 countries and speaks more than 15 languages. 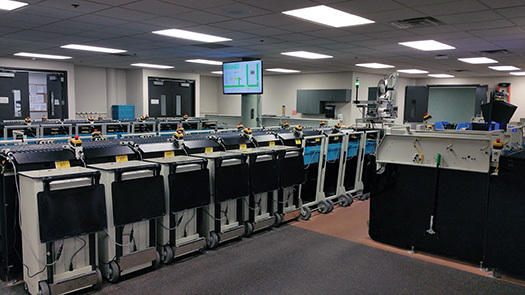 It helps NPL refine its services and products better to reach Nashville’s new American community. Based on IAC recommendations, NPL created online user videos in English, Spanish, and Arabic. These videos help patrons who are not fluent in English or face other barriers to literacy become more comfortable using the library. A return on investment study by the Nashville Chamber of Commerce found that for every dollar invested in NPL, $3 were returned to the city. But the metrics don’t tell the whole story. 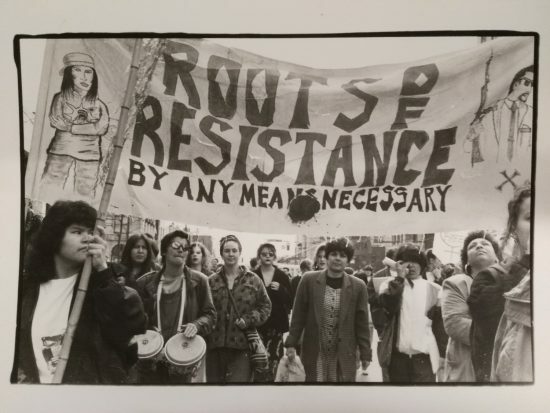 “Numbers and marketing campaigns aside, I believe the most powerful message we can send our community is by showing up and doing our work every day. This is how we tell Nashville we are invested in this city and its people,” says Oliver. “We will continue to bring a very urgent, very tangible definition to the old adage [that] public libraries offer something for everyone. These custom-designed programs are not simply ‘nice extras’ but instead critical services to meet community needs,” Oliver adds. “Finally, NPL will carefully plan and grow its footprint, using local data about future trends in middle Tennessee and engaging our patrons and neighbors to have a voice in our future.” Given NPL’s huge progress to date, there seems little question that that bright future will come to pass. Chicago Public Library (CPL) has reinvented its operations based on human-centered design: tailoring design-thinking strategies to libraries, creating a free toolkit for the field, and then investing in training more than 200 of its 1,000 staffers in the methodology (plus training every branch manager in human-centered design, management, and change management). CPL invited all staffers to contribute ideas, which are curated by a peer advisory team, then refined and tested using human-centered design. The process builds on the success of CPL’s existing innovations: YouMedia, the teen creativity space that not only extended to 12 of CPL’s 77 locations but became a national model; Learning Circles, lightly facilitated peer study groups for adult learners taking existing online courses (see p. 16 for more on this program); and CyberNavigators, who deliver computer and job search help. CPL is committed to creatively leveraging partnerships inside the library field and out, teaming with institutions from the Chicago Community Trust and the Museum of Science and Industry to IDEO, Denmark’s Aarhus Public Libraries, Peer 2 Peer University (P2PU), and the Digital Youth Network (DYN). It also garners funding from private and public sources, including the Bill & Melinda Gates, Knight, and MacArthur foundations and the Institute of Museum and Library Services—more than $100 million over the past four years. CPL is also leading the way on outcomes—both achieving and assessing them. For example, YOUmedia participants outperform their peers in both postsecondary enrollment and persistence to sophomore year of college; Learning Circle participation increased retention by three to five times. Last but not least, CPL is committed to elevating all libraries, not just its own. “We operate with...an eye toward sustainability and replication in all of our work,” says nominator CPL first deputy commissioner Andrea Sáenz. If libraries are the center of the community, it makes sense that they also convene the hardest conversations: those surrounding violence and hatred. When a mass shooter opened fire at Orlando’s Pulse nightclub in 2016, targeting its predominantly gay and Latinx clientele, Orange County Library System (OCLS) responded organically to the community’s grief, because the library, as part of that community, shared it: several OCLS staff members lost friends and were given time to grieve. As an institution, OCLS offered all staff access to grief counseling and time off to donate blood, and the staff association set up boxes to accept monetary and nonperishable food donations at all 16 branches for community centers that supported survivors and their families. OCLS also took a leading role in supporting the spirit as well as the body: all branches displayed rainbow #OrlandoStrong banners and created displays of titles that celebrate diversity and inclusion. CEO Mary Anne Hodel reached out to patrons through a message on the homepage. Librarians published a resource guide for coping with tragedy and documented communal grief through photographs on the Orlando Memory online portal, as well as preserving obituaries and oral history of the event. Art as activism was a strand that ran through the library’s response: OCLS offered coloring sheets featuring iconic Orlando destinations to help provide soothing activities for those affected and hosted Paint Strong Orlando, a collection of local artists’ reactions to the shooting. Staff produced a viral music video as part of the Keep Dancing Orlando project, which raised awareness for the One Orlando Fund; a one-year anniversary remembrance event featured musicians, poets, and writers. Congratulations on being named library of the year. Now, if only...the local taxpayers felt comfortable in this beautiful, beautiful building that is such a "champion of diversity and inclusiveness". What I mean is, the kind of people that get called to jury duty. They pay property tax. They are eligible to vote. It is a shame that you have such horrid operating hours, but I understand that you don't want people sleeping there after showering off in the sink. Thank you for keeping the children's area safe. the puppet shows are kind of neat. I think our libraries are fantastic so it's nice to know that the pro's do as well. Even the basics of the library thrill me. It seems like only a few years ago that I realized DVD's were available to check out. Whole seasons of TV shows, and new movies. Not everyone can afford cable or the price of admission at a theatre, so this is wonderful. 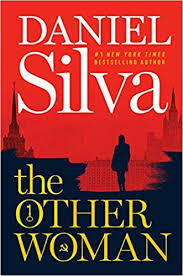 I have, at times, asked the library to order a particular book I wanted to read and they have done it every time. I'm still amazed every time. The work they do to meet the communities needs is inspiring and the focus on engaging children is brilliant. I remember in the "old days" calling the libraries help desk to ask questions like "How do you convert Celsius to Fahrenheit?" or "How much has the cost of living risen in the past 5 years?" With computers, I don't need to do that anymore but I still engage with the librarians, asking for book suggestions, etc. Recently, someone tried to get me to join the Y (I can't afford it), listing off the great classes they have. I showed them the magazine from NPL, Unbound, and how they had many of the same classes FOR FREE! Congratulations Nashville Public Library! You deserve it. Having had the privilege of growing up in St. Louis Park, Minnesota, including the proximity to the Hennepin County Library, I know a little something about libraries. What I didn't know, was what I spoiled library patron I was, until I came to Nashville during the early 1970s. It was then that I learned that the South, in general, and Nashville in particular, did not put the same emphasis on library systems I not only took for granted but believe(d) I had a right to take for granted. I was shocked when I discovered, on my first visit to the Ben West Library (then Nashville's "main" library) how small a facility it was; about the size of Hennepin County's branch libraries. Book selection was limited and books on certain topics were shelved behind the librarians' desk and available only upon request. That said, I always appreciated the Ben West librarians. They made the most of limited resources and went out of their way to help me, particularly with projects involving research. I am as grateful to them as I am my cherished school teachers and mentors. Nashville's suburban libraries of the time? Don't ask. They were on par with my elementary school libraries. When the Ben West library closed and the Main library relocated to its present location, I was at first afraid that the new architecture was to be its point of emphasis. I was wrong. 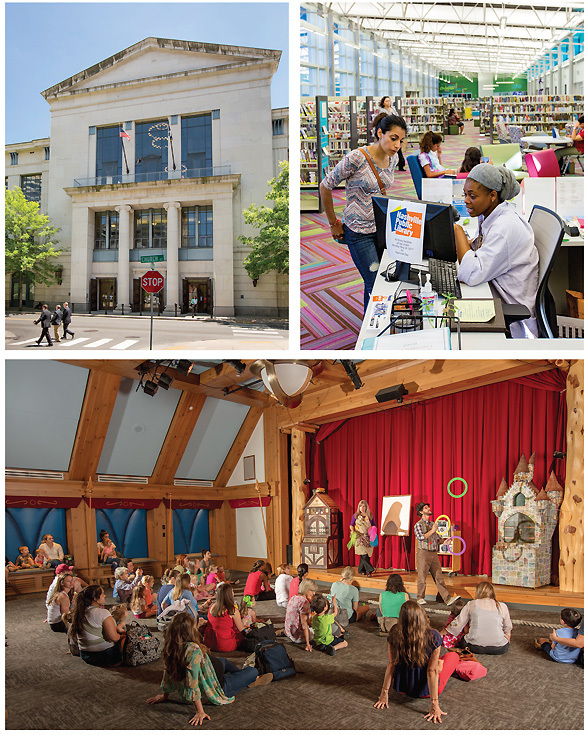 Nashville's present Main library is in every way worthy of the Library Journal award. What few books I can't find there are typically available through Interlibrary Loan and I particularly enjoy the Nashville Room's genealogy resources, particularly free access to its ancestry.com subscription. The branch libraries have gotten facelifts and there even some "new" ones. And I love the succession of book displays and rotating exhibits at Main- not to mention the benefit book sales at Main and the branches throughout the year! Still, there remains work to be done: I'd like to see more non-Nashville-related genealogical resources, and fewer musical events in the lobby that can be heard on the upper floors. Main library restrooms should be upgraded and properly maintained, with patrons incentivized to do their part. And, with all of the attention paid to "name" authors, it would nice if the Nashville Public Library would occasionally recognize local authors, such as myself (as it does "carpetbaggers") when moderators and panelists are chosen for varying events. Also, while I appreciate the library's enticements to youthful patrons, it would be great to have more catering to seniors. How about offering the 55 Alive course (or whatever its called now)? As one of the library's financial contributors and most active users, I would also welcome the chance to have a seat on the library board. 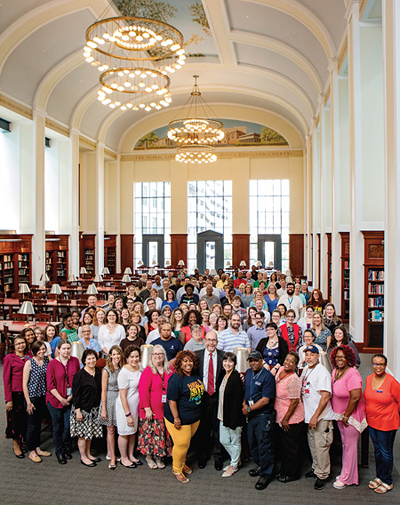 Congratulations to Kent Oliver, the library's first activist director, and the staff of the Nashville Public Library, on having received the Library Journal's 2017 Library of the Year honors! May I suggest that oblique criticisms of NPL because homeless people use the downtown branch are misdirected. These people have nowhere to go, so they go to public places. Wealthier taxpayers and their representatives can address this issue in a number of ways, but the solution can't simply be banning and removing undesirables from public spaces. This is a pretty ill-structured comment. I'm honestly not sure what you're mad about. I think maybe you should go to a few of these courses they offer so maybe you'll be able to better be a meanie online. Side note, the type of people who pay property tax are not the type of people who attempt to shower in the sink and sleep at a library. CONGRATULATIONS!! I THANK GOD FOR OUR NASHVILLE PUBLIC LIBRARIES!! KEEP UP THE GREAT WORK. MAY GOD CONTINUE TO SHINE UPON THE BLESSINGS THAT YOU PROVIDE TO MANY!. Well deserved! I relocated to Nashville from New York City in 2014 and have found the NPL and it's branch system second to none. A godsend to staying current and connected, through its lending libraries, e-media integration, exhibits and events. CONGRATULATIONS, to all the NPL staff and board members. My perfect place to live, close to a library, grocery store and entertainment ( playhouse, live music and public parks), well Nashville downtown has it all. My family has lived downtown about six years. Thanks you for welcoming all through your doors. Continue your efforts, Nashville benefits greatly. I certainly appreciate your helpfulness. I am a transplant from NJ & I love Nashville....and I love the Nashville Public Library! I use a Kindle for most of my reading. Most of the time I can download the books I want but some of the time, the library websites fails me. In fact I called today to try to get help because not all of my books were noted as taken out - on my account. The library employee was unable to explain why there was a discepancy. However, I love the library & have been extremely satisfied with their help when I recently had a project to present. They helped provide a DVD & books for me as references on a famous TV comedian, which assisted me greatly with my presentdtion! Congratulations! on your Award! You are truly worthy of it! Love the Nashville Public Library! Well organized!! Deserves the award! Congratulations!!! What a weird comment from Bubba Dawg. The "jury duty" and "property tax" comments make absolutely no sense. 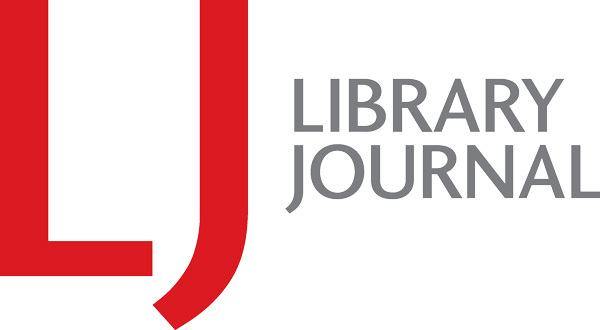 I guess their are trolls everywhere, even on library journal sites.